In the explosion at Halifax, Nova Scotia, in 1917, the SS Mont-Blanc exploded after a fire caused her picric acid cargo to melt, and then explode. In numerous naval engagements, it has not been a direct hit below the waterline that sinks the ship, but a fire that detonates explosives in the magazine that blows the ship to pieces. On October 4, 1918, the T. A. Gillespie plant in Morgan, New Jersey had an accidental explosion (it was a plant for loading explosive shells). That explosion caused a fire that triggering numerous explosions over three days. 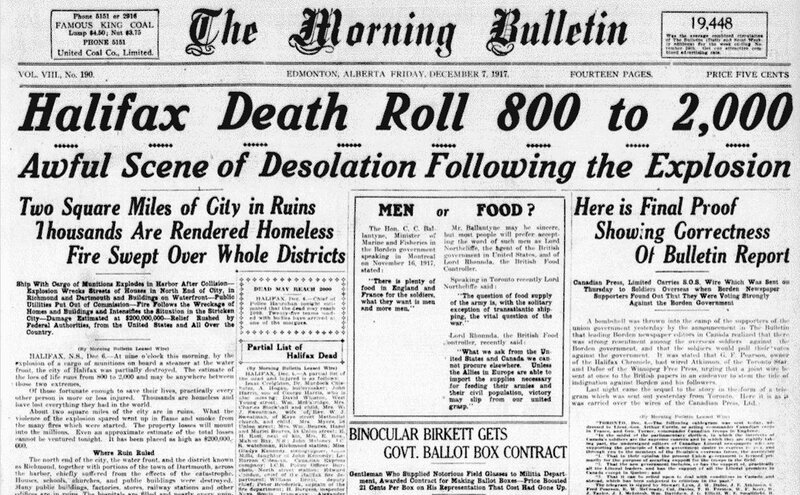 Sixty-two thousand people were evacuated from nearby towns. The damage was estimated at 6 kilotons of TNT explosive, enough to supply the Western Front for six months. Windows were broken as far away as 25 miles. Explosive ordinance from the explosion was scattered for over a mile, and was still being found at late as 2007. On July 17, 1944, munitions being loaded at Port Chicago, California exploded, destroying the ship, the docks, and killing 320 people. The list of unintended munitions explosions goes on for pages. Smaller explosions have been innumerable — shells exploding inside large caliber Navy guns, explosions in gun turrets, fires on flight decks of aircraft carriers setting off munitions in planes or below-decks. In civilian applications, such as mining, well drilling, and oil exploration, explosives are handled and transported daily in close proximity to populations. The need for safer explosives has led to a class of compounds designed to be difficult to detonate. This effort has led to new explosive molecules like TATB, and to new ways to make older explosive molecules less sensitive, like bonding them with rubber or plastic, or adding compounds to the mix that desensitize them. Not all polymer-bonded explosives are less sensitive. PBXN-101, for example, is HMX in a binder of polyester resin. The thermosetting plastic is brittle, and very sensitive to shock or bullets, and to heat. A later PBX, called PBXN-106, made from RDX and polyurethane rubber, was much less sensitive to shock and fire, and was selected for use in naval shells after some disastrous in-bore explosions of older explosives. After 1970, when accidental and fire-caused explosions during the Vietnam War brought the problems to a new focus, work began in earnest on developing less sensitive explosives. In some of the first tests of rubber based PBXs, warheads made with the standard Composition B explosive (60/40 RDX and TNT) and warheads loaded with PBXN-107 (86% RDX in polyacrylate binder) were both exposed to fire from aviation fuel. The Composition B warheads exploded. The PBXN-107 warheads merely split open and burned. Besides binding with polymers, another way to make explosives like RDX and HMX less sensitive is to reduce the particle size. In tests with mixtures containing micron-sized particles compared to nanometer-sized particles, the nanometer sizes were roughly half as sensitive to friction and impact as the micron sized. One of the earliest insensitive explosives developed was ammonium picrate, known as Dunnite, or Explosive D. Developed in 1906 by US Army Major Beverly W. Dunn; it is a salt of picric acid. Unlike the metal salts of picric acid, which are generally much more sensitive to heat and shock than the acid itself, the ammonium salt is much less sensitive. Dunnite's insensitivity led to its use in armor-piercing shells, as it could withstand the shock of penetrating steel ships hulls, exploding inside the ship on a fuse. In this way, it echoed TNT's replacement of picric acid for that same purpose earlier, when armor was lighter. Ammonium picrate is considerably less sensitive to impact than TNT, although it explodes at 318° Celsius, whereas TNT detonates at 457°. 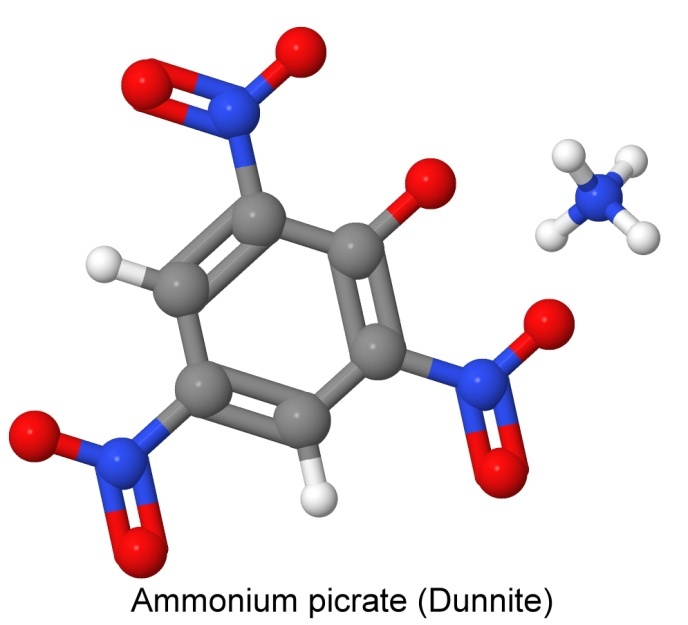 Like picric acid, ammonium picrate can form metal picrate salts in contact with iron, copper, lead, and other metals, that are extremely sensitive to shock and heat. Insensitive explosives require powerful explosions to set off all of the charge. When mercury fulminate or lead azide is used to detonate ammonium picrate, not all of the explosive actually detonates. A more powerful initiator, such as tetryl, is needed to get all of the explosive involved. Having a sensitive primary explosive next to your insensitive explosive defeats much of the reason for having an insensitive explosive in the first place. If the bomb or warhead were in a fire, it would still detonate. For this reason, initiators called "exploding bridgewire" detonators were developed, and widely used in nuclear weapons. Exploding bridgewires are like blasting caps in that they are electrically detonated. The difference is that much more current is sent through them much more quickly. The wire itself literally explodes. Luis Alvarez and Lawrence Johnson invented the exploding bridgewire detonator for the first plutonium bomb as part of the Manhattan Project. They needed much more precise timing than explosive primers could deliver, as the bomb depended on a perfectly spherical implosion to get the plutonium to critical mass. In an exploding bridgewire detonator, a high voltage pulse vaporizes the wire in a few microseconds, and this sets of the secondary explosive directly, or a booster charge with a very high detonation velocity that then sets off the main charge. All of the bridgewires in a nuclear weapon (there were 32 in the first Fat Man tests) can be fired to within 100 nanoseconds of one another. In an RDX explosive, the detonation only travels 0.875 millimeters in that time, so the charges are set off at effectively the same time. 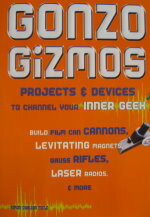 Newer versions of the detonator are exploding foil initiators, where a couple thousand volts of electricity from a capacitor explodes a foil bridge. These can directly detonate some of the new heat resistant explosives like NONA. One of the new less sensitive explosives being developed is 1,1-diamino-2,2-dinitroethane, known by the contraction DADNE, or more commonly, FOX-7. FOX-7 is a much simpler molecule than many of the newer explosives (compare to CL-20, HMX, or TATB) but it is in the same class as TATB, and shares its insensitivity. It is less dense than TATB (1.885 grams per cc, as opposed to 1.93), and has a lower melting point (238° Celsius compared to 350°), but it has a higher detonation velocity (8,870 meters per second, compared to TATB's 7,350) approaching HMX (9,100). FOX-7 is insensitive to friction, and in drophammer tests, none of the samples detonated until the hammer was dropped from at least 63 centimeters. Larger crystals (250 microns instead of 70) were even more stable, at 79 centimeters. FOX-7 is also thermally 40% more stable than RDX and 60% more stable than HMX. FOX-7 has been bonded with small amounts of the energetic polymer polyGlyN to make an insensitive PBX with a detonation velocity of 8,335 meters per second. There are three new insensitive explosives used in the new composite mixture IMX-101, designed to be an insensitive explosive to replace TNT in army artillery shells. The IM stands for Insensitive Munitions. 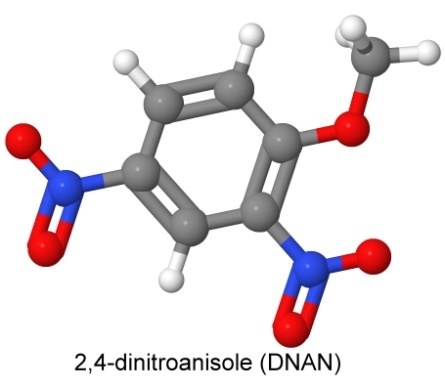 The first explosive in IMX-101 is 2,4-dinitroanisole, known as DNAN. DNAN is not as powerful as TNT (its detonation velocity is 5,670 meters per second) and is less dense. As you might expect from its similarity to picric acid, it is also a decent dye. It apparently also makes a good insecticide. In mixes with other explosives, its castability makes it a good replacement for TNT. Molten DNAN dissolves RDX just as TNT does (not an issue in IMX-101, since it has no RDX, but useful in other formulas). 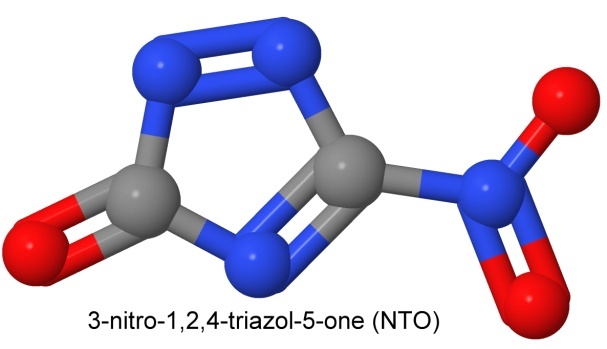 The second insensitive explosive in IMX-101 is 3-nitro-1,2,4-triazol-5-one, called NTO. With a detonation velocity equal to RDX (which would make it about 8,750 meters per second), NTO is much less sensitive to heat, shock, friction, and impact. With a density of 1.93 grams per cc, it is denser than both RDX and HMX. It is made from inexpensive starting materials, and high yield processes are in place. With its high density and high detonation velocity, it makes up for some of the disadvantages of DNAN. NTO was first synthesized in 1966, but the inventors did not investigate its use as an explosive. That task fell to Michael D. Coburn, who patented its use as an insensitive explosive in 1987. Working at Los Alamos National Laboratory in New Mexico, Coburn had been investigating several other insensitive explosives for use in nuclear weapons and deep drilling wellbores for geothermal energy and oil exploration. The third ingredient in IMX-101 is nitroguanidine, known as NQ (even though there is no Q in the chemical name — the name NG (for nitroglycerin) was already taken). 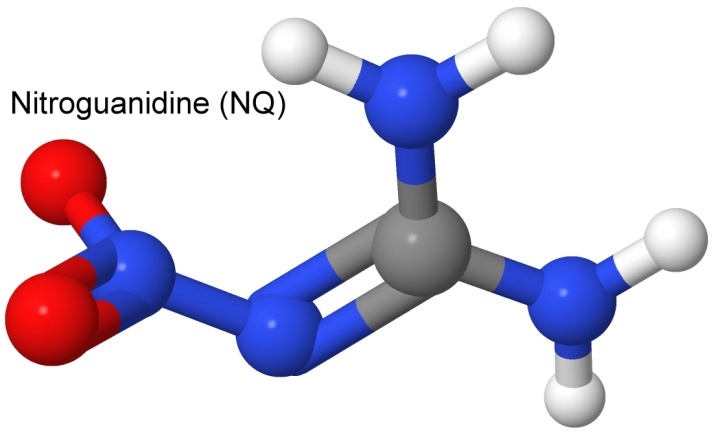 Nitroguanidine is inexpensive (it is used as a fertilizer, and in airbags), and is insensitive to heat, shock, and friction, but has a high detonation velocity (8,200 meters per second). It has been used since the 1930's in triple-base (with nitroglycerin and nitrocellulose) smokeless powder, because it reduces the flame temperature, and thus reduces the flash from the gun barrel (which can give away position at night). The lower temperature also reduces wear on large artillery bores. Like DNAN, it is also used as an insecticide, with effects similar to nicotine. Like the other ingredients in IMX-101, nitroguanidine has a low sensitivity to shock, heat, and friction. With all three ingredients working together, the detonation velocity of IMX-101 comes out as the same as TNT, the explosive it was designed to replace. It is considered an EIDS — an Extremely Insensitive Detonating Substance. It is affordable, and can be produced in TNT-like quantities. It can be melted and cast just like TNT, so no retooling is necessary. IMX-101 is designed as an insensitive replacement for TNT. To replace the more powerful Composition B (60% RDX and 40% TNT, detonation velocity 7,980 meters per second), a more brisant explosive was needed. The result was IMX-104. IMX-104 is a mix of DNAN, NTO, and RDX. It melts and casts just like Composition B, and has a detonation velocity almost as good — 7,400 meters per second. The use of RDX in IMX-104 makes it more sensitive than IMX-101, but it is still much less sensitive than the Composition B it replaces. A mix similar to IMX-104 is PAX-21 (RDX, DNAN, and ammonium perchlorate). The ammonium perchlorate was seen to be less environmentally friendly, so PAX-41 was developed. 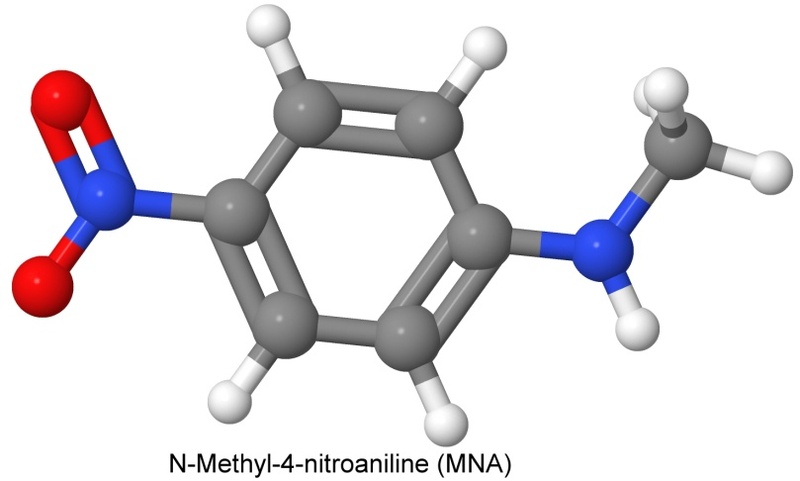 It is a mix of RDX, DNAN, and another insensitive explosive, N-methyl-4-nitroaniline, called MNA. PAX-41 was designed as a replacement for Cyclotol, a more brisant mix of RDX and TNT than Composition B (Cyclotol has 65% to 85% RDX). In 1901, the husband and wife team of Irma Goldberg and Fritz Ullmann described a new method for sticking organic molecules together using precipitated copper powder as a catalyst. They called it the Ullmann reaction, and named a similar reaction also using the copper catalyst the Goldberg reaction. Two molecules made up of a benzene ring with a halogen atom attached (chlorine, bromine, or iodine) can be joined together where the halogen atoms used to be. The chemist Joseph Carl Dacons, working at the Naval Ordnance Lab in White Oak, Maryland and the Naval Surface Weapons Center in Silver Springs, Maryland, used the Ullmann reaction to create several new explosive molecules that are heat resistant. Heat resistance is very important in missile warhead explosives, since the high speed of the missile generates very high temperatures as it travels through the air. In 1960, Dacons and Mortimer Kamlet investigate the thermal decomposition of TNT in order to begin research on heat resistant explosives. Dacons publishes the eighth volume on heat resistant explosives, describing nonanitroterphenyl, or NONA. You can see the three phenyl rings joined together, and the nine nitro groups attached. This looks a little like three picric acid molecules stuck together. NONA was much more thermally stable than TATB, and had explosive performance and heat or friction sensitivity similar to Tetryl. In impact studies, it was in between PETN and RDX in sensitivity. NONA found use as the explosive to use in downhole well applications for the oil and gas industry, as the temperature miles underground is too high for conventional explosives. In 1962, Dacons and J.M. Rosen publish a study about how the structure of organic explosive molecules affects their thermal stability. On August 31, 1963, Dacons filed a patent for an improved method for making NONA, using the Ullmann reaction. On December 30, 1963, Dacons and two other chemists patented the process for making a heat resistant explosive called DIPAM using older methods. On May 28, 1964, they file a patent for a much simpler method, using the Ullmann reaction. In the patent, they describe how adding two amino groups to the existing explosive raised the melting point to where a thermally stable explosive results. The results of the research into the thermal degradation of TNT are starting to pay off. 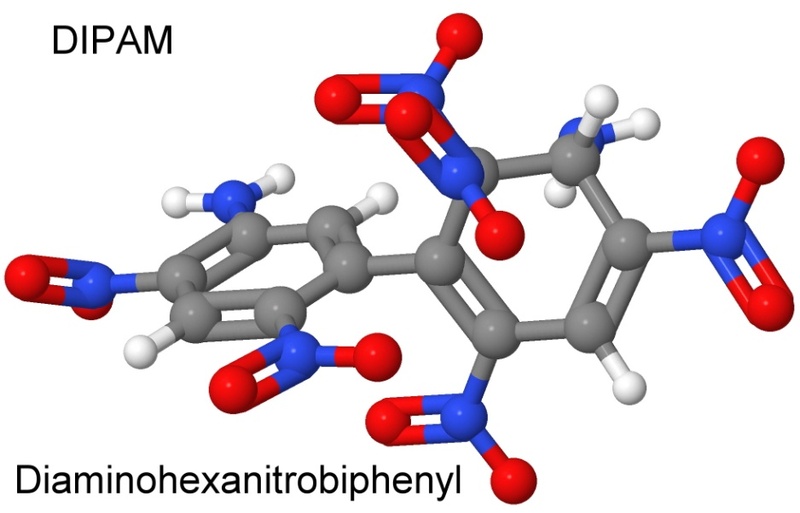 DIPAM is related to another explosive molecule, hexanitrobiphenyl, or HNBP. 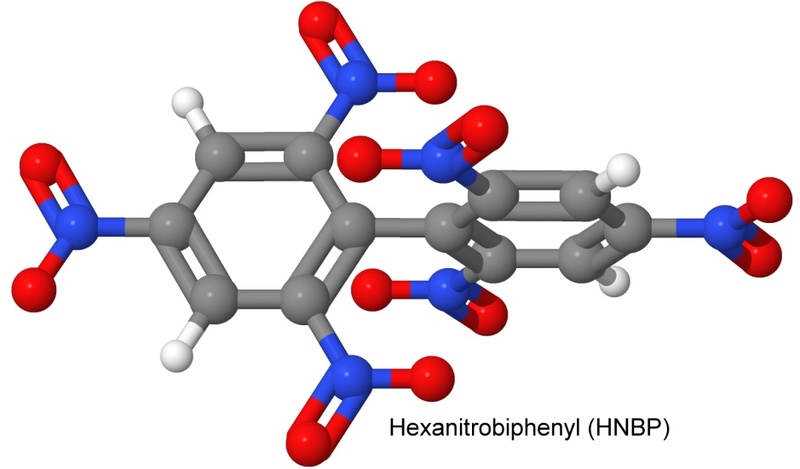 Hexanitrobiphenyl was one of the molecules synthesized by Fritz Ullmann, using his eponymous reaction. He needed to use a solvent to slow the reaction of picryl chloride with his finely divided copper catalyst because otherwise the mixture would explode. Dacons reports that it is a heat insensitive explosive. He uses the acronym HNB, which unfortunately is also an acronym for several other explosives. In 1965, Dacons and two other chemists report on the improved method of making the heat resistant explosive NONA using the Ullmann reaction. On December 15, 1965, Dacons files a patent for Dodecanitroquaterphenyl, where he has stuck together four phenyl rings, all nitrated. 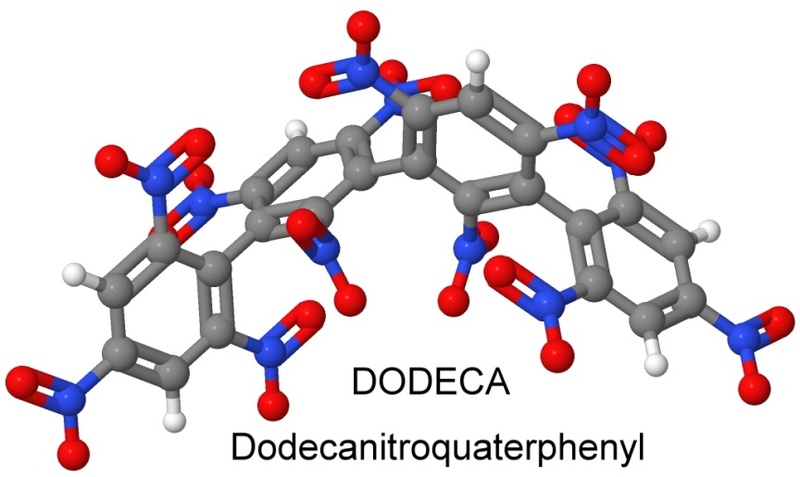 This is the heat resistant explosive DODECA, which turns out to be cheaper to make than NONA, as it starts with cheaper ingredients and has a high yield. 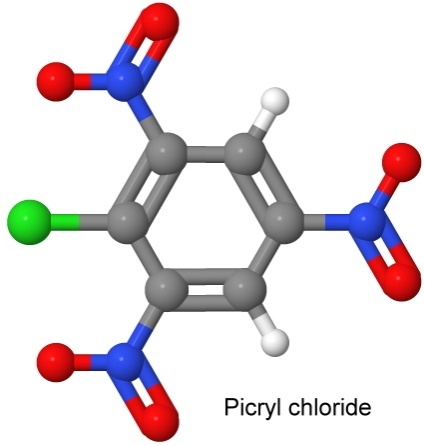 On January 18, 1966, Dacons and Kamlet reported creating PIPICL, by joining picryl chloride with chloroanisole using the Ullmann reaction, and then nitrating the result. The result looks a lot like a couple of picric acid molecules stuck together. 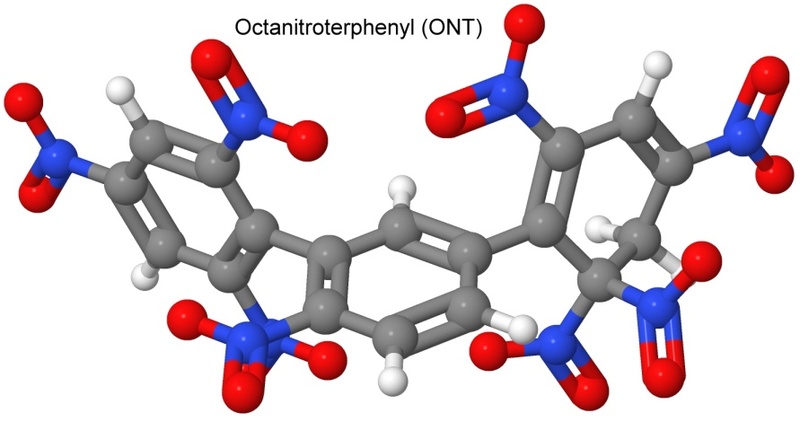 On Nov 22, 1967, Dacons filed a patent for the explosive octanitroterphenyl, or ONT. Looking for a more powerful heat tolerant (yet still impact sensitive) explosive than NONA, Dacons again uses the Ullmann reaction to make a very similar molecule, this time with one fewer nitro groups. This decreased the impact sensitivity over NONA (hammer impact detonation at 64 centimeters instead of NONA's 37 centimeters), and increased the heat tolerance over NONA by 20° Celsius. 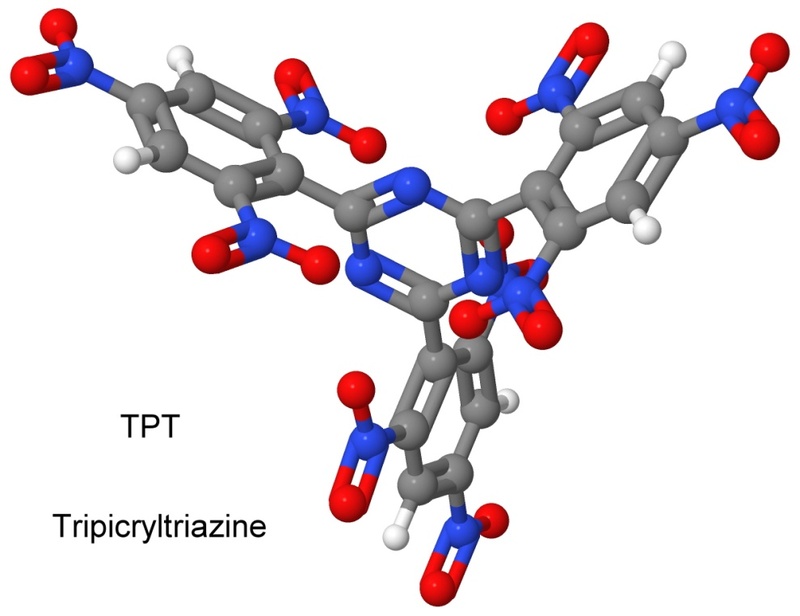 A year later, on November 20, 1968, Dacons filed a patent for tripicryltriazine, or TPT. TPT is less impact sensitive (93-centimeter hammer drop) than ONT (64 centimeter) or NONA (37 centimeter), while being of comparable explosive force. While NONA is good to 300° Celsius and ONT to 320°, TPT melts at 362°. As a result of his many papers, books and patents in organic chemistry and explosives, Joseph Carl Dacons is mentioned in several books and articles about African American inventors, and his patents are cited and referenced in much of the current literature on heat resistant explosives. The need for thermally stable explosives was recognized in many areas, and one of the better-funded labs was the Los Alamos National Laboratory (LANL), run by the University of California (although the lab is in New Mexico). 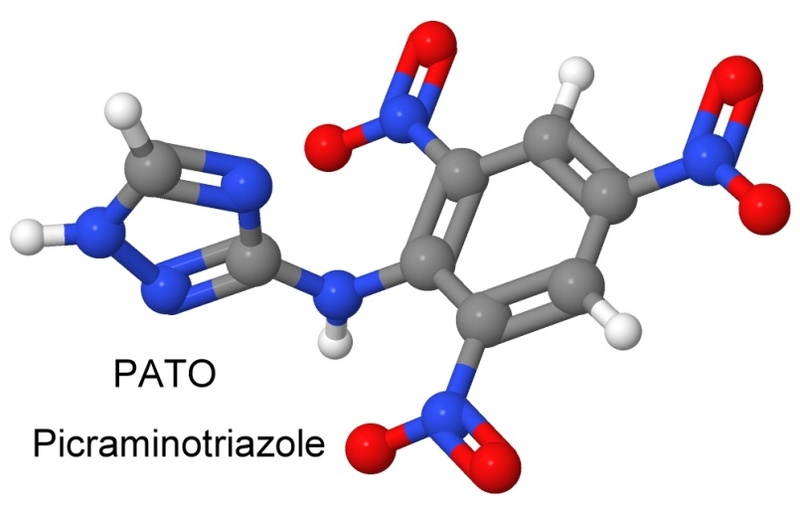 On May 17, 1967, chemist Michael D. Coburn files a patent for a new explosive made at LANL called 3-picrylamino-1,2,4-triazole, nicknamed PATO. It was a heat insensitive explosive, but also impact insensitive, requiring a hammer drop from higher than 320 centimeters to cause it to detonate. As PATO is made in a single-step process from inexpensive starting materials, it was expected to be a low cost heat resistant and impact insensitive explosive. It has a high density of 1.94 grams per cubic centimeter, melts at 310° Celsius, and has a detonation velocity of 7,850 meters per second. 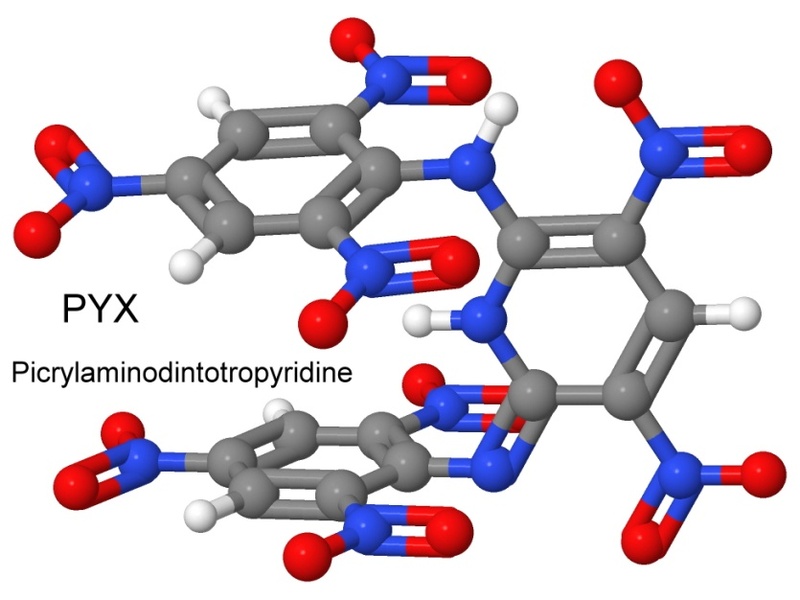 On March 26, 1971, Coburn filed a patent for another new explosive, called 2,6-bis(picrylamino)-3-5-dinitropyridine, and given the shorter name PYX. The patent describes the unique characteristics of the new explosive, stating that PYX "is a moderately powerful explosive that is more thermally stable than any other explosive of comparable oxygen balance thus far reported. In addition to being chemically inert, the material has no vapor pressure at high temperatures. 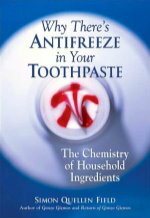 The compound is easily prepared in good yield from relatively inexpensive, commercially available starting materials." PYX is stable to 350° Celsius, with an impact sensitivity of 63 centimeters in the hammer drop test, and a detonation velocity of 7,448 meters per second. Not only is it a good idea to have thermally stable explosives in ICBM re-entry vehicles that get white-hot as they return to earth, but the LANL also has a Hot Dry Rock Geothermal Energy Development Program. Drilling through hot dry rock occasionally requires blowing up a stuck drill pipe in deep water-filled wellbores, where the water under pressure reaches temperatures above 320° Celsius. In 1979, Coburn, was a visiting scientist at Elgin Air Force Base, in Florida, where he started developing some new heat resistant explosives. One of the explosives developed there was a mixture of 95% PYX and the polymer Kel-F 800. That polymer is basically Teflon with one of the fluorine atoms replaced by a chlorine atom. The Air Force was evaluating the mix as a high temperature booster explosive, but the team back at Los Alamos tried it out, successfully, as a hot wellbore explosive. Geothermal wells are not the only hot wells around. The deeper the drill goes, the hotter the rock gets (eventually you would get to the molten core of the earth). Explosives are used in all deep kinds of drilling operations, such as oil and gas exploration. On September 1, 1976, Coburn filed a patent on the heat resistant explosive ammonium 2,4,5-trinitroimidazole, ATNI for short. With an impact sensitivity of 50 centimeters, and a detonation velocity of 8,560 meters per second, ATNI has the power of RDX, but much better thermal stability. In the patent, he describes potassium trinitroimidazole as the inspiration, a molecule with no great explosive potential, because the potassium is "dead weight", and the rest of the molecule is poorly oxygen balanced. Swapping the potassium for the ammonium ion fixes both of these problems in a single stroke. In 1987, Coburn patents the use of NTO (shown earlier) as an explosive. The most thermally insensitive explosive known at this time is N,N'-bis(1,2,4-triazol-3-yl)-4,4'-diamino-2,2',3,3',5,5',6,6'-octanitroazobenzene, known by the named DCONAB and BTDAONAB. It was synthesized by the Indian chemist Jai Prakash Agrawal, another pioneer in thermally stable explosives. Agrawal explains the four avenues to making an explosive less sensitive to heat, and it is useful at this point to list them each, with examples. 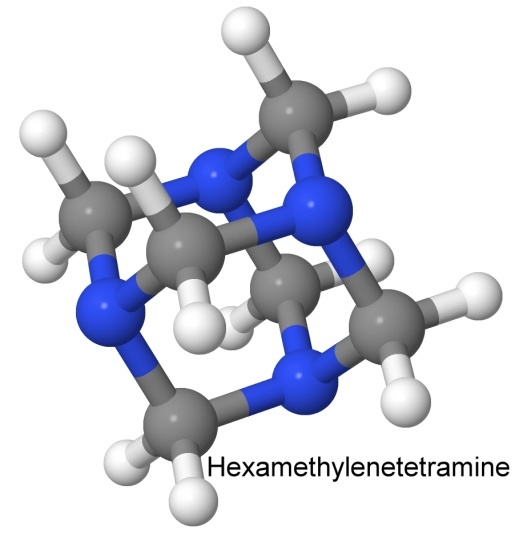 One of the first heat stable explosives was hexanitrostilbene, or HNS. 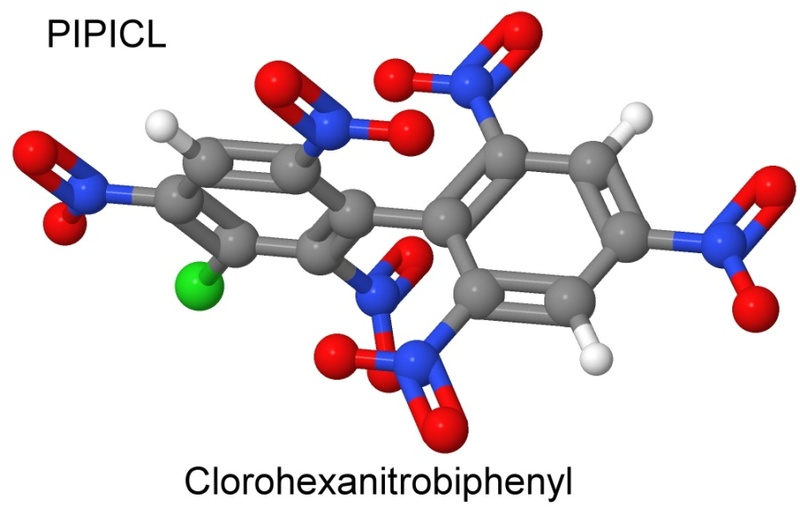 On May 5, 1964, Kathryn G. Shipp of the Naval Ordnance Laboratory in White Oak, Maryland, filed a patent for the molecule, where her synthesis consisted of adding TNT to Clorox bleach. This explosive was vacuum tolerant and heat insensitive, and was used as an explosive on the moon by the Apollo missions to perform lunar seismometry. 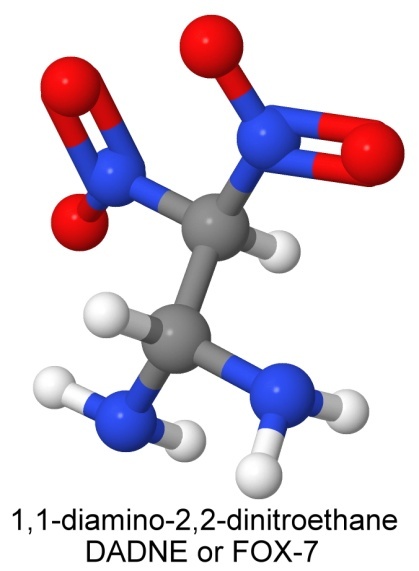 Previously, no one had been able to add more than 5 nitro groups to stilbene, since the nitro groups in place already prevent any more from being added. 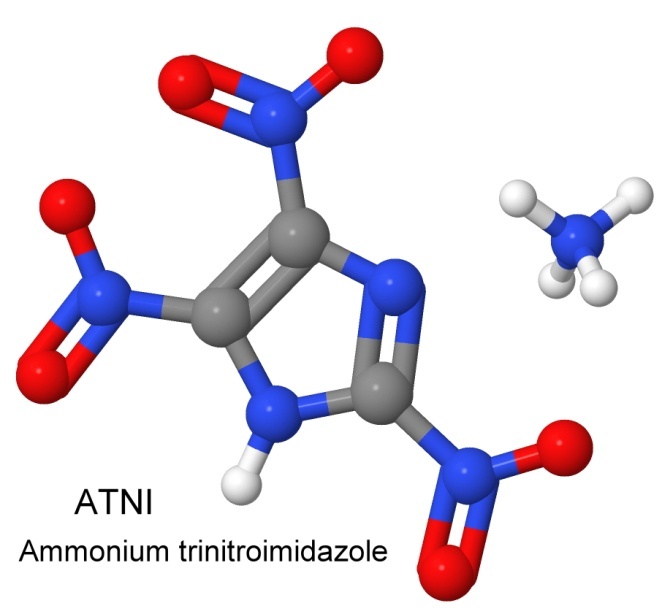 By starting with two molecules that already had three nitro groups each (trinitrotoluene) and then joining them, this problem is circumvented. 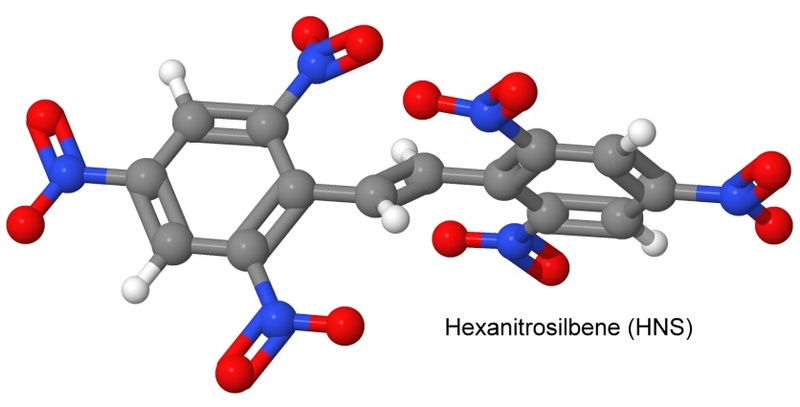 Hexanitrostilbene is an example of one of Agrawal's four avenues to heat stability: conjugation. The two TNT molecules have been joined together by a double bond. 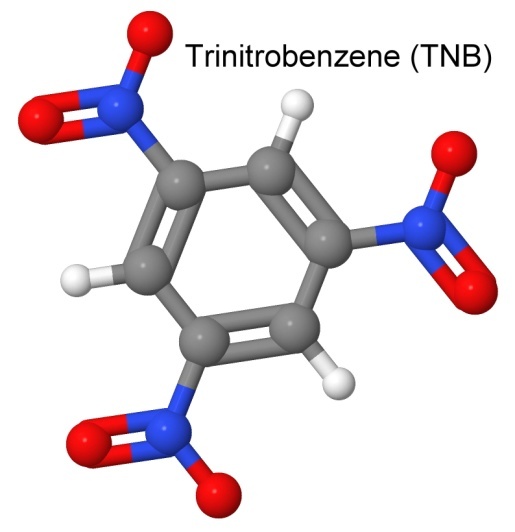 A very unstable explosive is trinitrobenzene, or TNB. By replacing each hydrogen atom with an amine group (NH2), we get the very heat stable molecule TATB (already discussed earlier). This is an example of a second of Agrawal's four avenues to heat stability: adding amino groups. 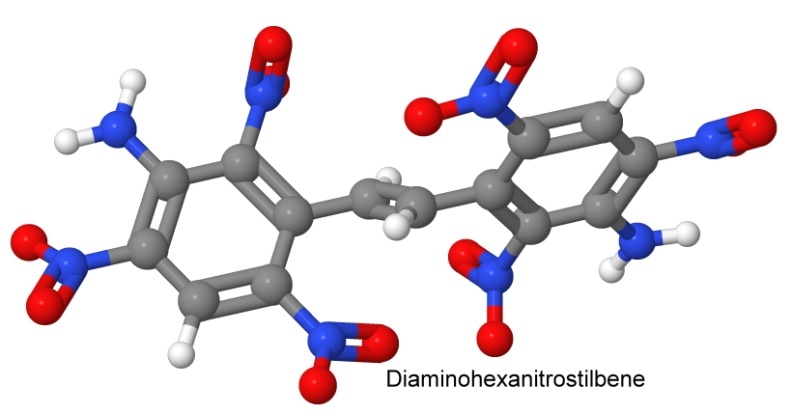 Adding amino groups to HNS gives us two of the avenues, and a very heat stable molecule, diaminohexanitrostilbene, with a much higher melting point. A third of Agrawal's avenues is the condensation with triazole rings. This was used by Michael Coburn, who produced PATO that way (shown earlier). The last of Agrawal's four avenues to heat stability is converting an acid to a salt. This sometimes backfires, as when picric acid is reacted with lead, copper, or iron. But reacting it with the ammonium ion to get ammonium picrate works well to heat stabilize the molecule. 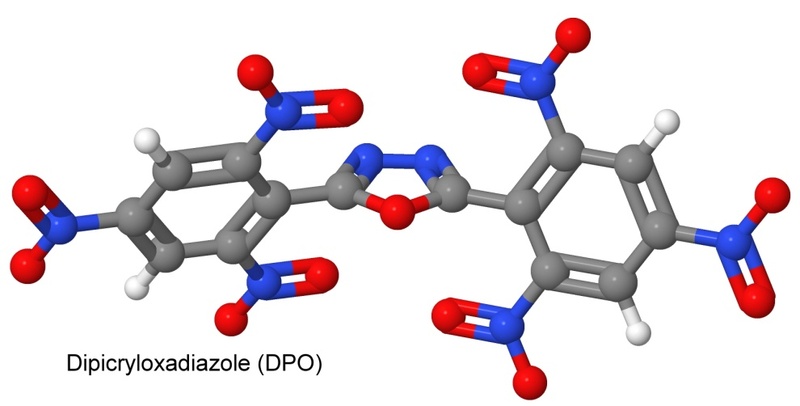 In searching for a heat insensitive replacement for PETN, where sensitivity to shock is an asset, making it useful in a detonator, USSR chemists (Sharmin, Buzykin, and Fassakhov) in 1965 synthesize dipicryloxadiazole, or DPO. With the thermal stability of HNS and NONA, but the shock sensitivity of PETN, it was a direct hit. Now electric bridgewire detonators or exploding foil detonators could be made with a thermally stable booster explosive to set off the main charge of a heat tolerant shock insensitive explosive. 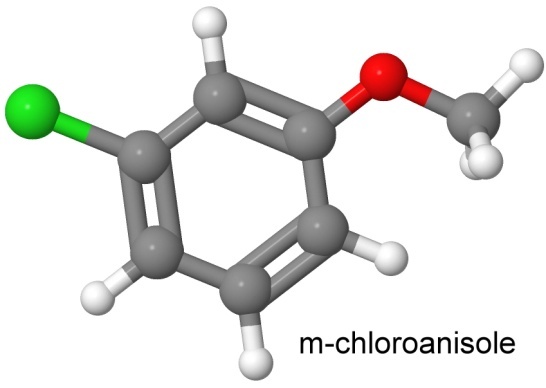 The molecule is heat stable because it is conjugated — two nitrated benzene rings are joined. But the single bond between the two nitrogen atoms in the bridge between them is easily broken by shock, and once that one bond breaks, the whole molecule falls apart and we get an explosion. Increasing the density of an explosive is one way to make it more powerful. One way to increase the density is to make the molecule bend around and attach to itself in one or more places. Extreme examples of this are the cage-like molecules, such as CL-20 (shown earlier), cubane, and adamantane. 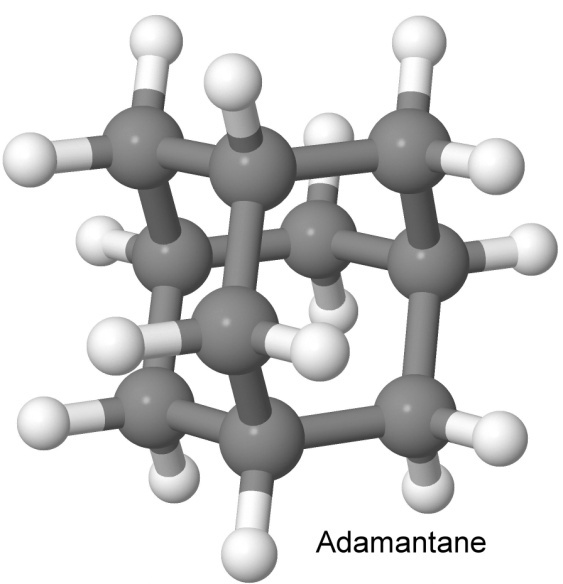 Adamantane has a six-carbon base, from which three carbon atoms rise like pillars, and then connect to yet another carbon to form a peaked roof. 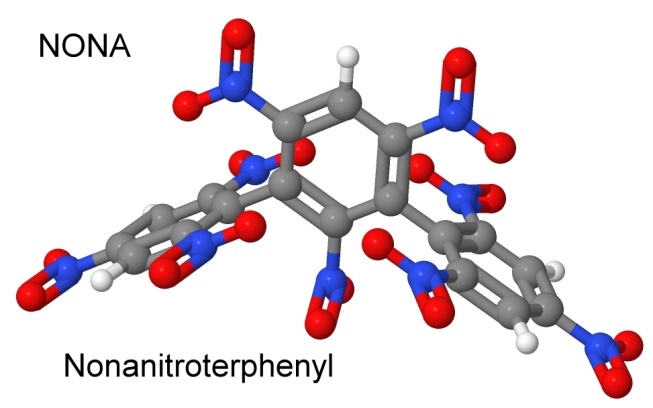 Unlike many cage molecules, the bond angles in adamantane are not strained. This makes the molecule stable, as there is no energy waiting to be freed by a rearrangement of the molecule. It can be thought of as three six-carbon rings, each ring sharing half of its carbon atoms with another ring. The name comes from the Greek word meaning diamond, as the arrangement of the atoms in space is the same as it is in diamond. At $1,000 per kilogram, adamantane is not one of the cheapest starting ingredients for a modern explosive. Taking advantage of the stability and density of adamantane, chemist Everett Gilbert and Gilbert Sollott filed a patent on October 14, 1980 for a way to add four nitro groups to adamantane to make an explosive out of it. 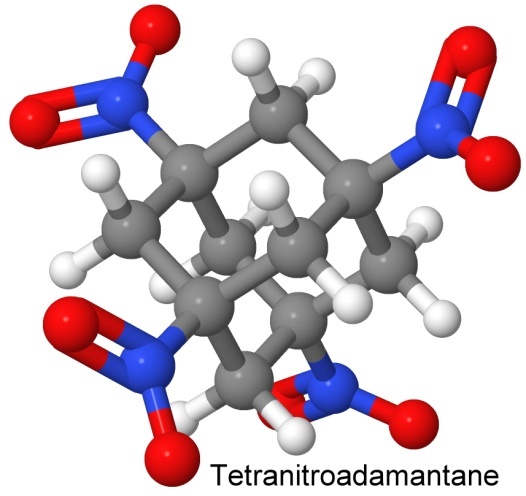 The resulting molecule, tetranitroadamantane, is heat stable, not exploding until it reaches 400° Celsius. In drophammer tests, it stands up to a drop from 150 centimeters (TNT can only withstand 65 centimeters), making it impact insensitive as well as heat insensitive. 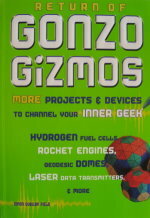 Kits and parts are available in our catalog.